TUCSON, Ariz. - Congress has designated Martin Luther King Day as a National Day of Service. Monday some of your neighbors worked to make our community better. At The Salvation Army's Hospitality House extra cots are ready to set up for Operation Deep Freeze, a program for extra shelter space kicking in now to give more of the homeless a safe escape from the cold snap moving in. Dan Reynolds says he was already driving to Tucson Mall when he heard on the radio that Operation Deep Freeze was in effect so he bought socks and warm coats and brought them to Hospitality House. 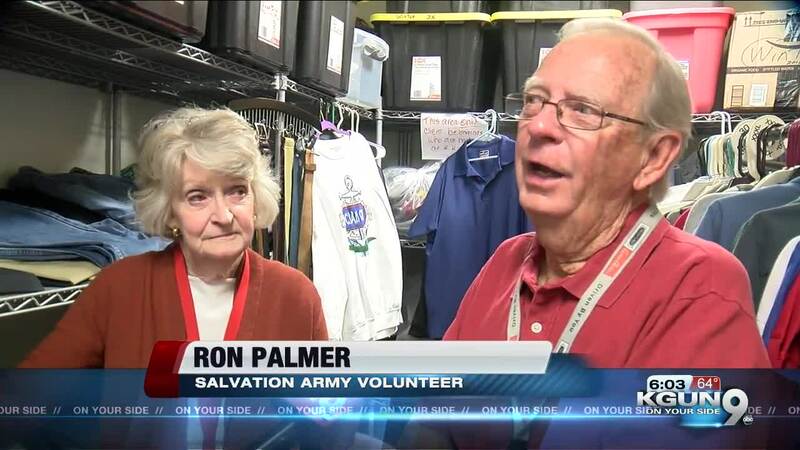 Managing and handing out donated clothes is one of the many ways Pat and Ron Palmer volunteer at the Salvation Army. Ron Palmer says, “If you look around and you see how they're living and it's just a shame that we have anybody on the streets; it's just one of those things where you just do, 'OK I want to help society, I want to help these and this is a need." There can be many ways to volunteer, including help at Pima Animal Care Center . Volunteers assembled beds to keep the animals comfortable while they wait for new homes. Others created dog and cat toys to help the pets pass the time. Natalie Kurgat is another young girl who described why she volunteered: “One, because I got a dog here and two because I really like animals." Volunteers say they'd love to have more people join them. At the Salvation Army, Pat Palmer says the gratitude keeps her going, like the night she was leaving the men's dorm. “I walked out and I said, Good night gentleman. And somebody yelled, goodnight, mom. And then they realize what they said. And they kind of giggled and stuff. But that's kind of that's kind of where we are."